Choose your favorite Dino and Dash to victory! 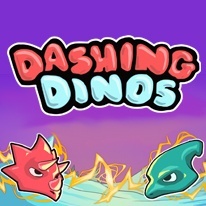 Dashing Dinos is a fast-paced, physics-based, local multiplayer game. Play against a couple of friends on your couch or bring your next house party to a whole new level! Choose the Dino that suits your play-style best and go wild with unique equipment choices. There is no reason why your Dino can't be a crazed, pumpkin-wielding Viking Angel! CHARGE your DASH-POWER to the max...AIM at your target...RELEASE the DASH and send your opponents flying! - Secure your win with a variety of pickups! - Enemies can be poisoned, frozen, confused, or even blown up, while you can escape safely - in invincible mode. - Be the lone survivor in a deadly match! - Score goals against your friends or steal their precious, precious eggs.